Helen Hollick - Reviews - "Discovering the Diamond"
Are you thinking of writing a novel? Discovering the Diamond gives tips and advice for aspiring writers, especially self-published/indie writers. I wrote it in conjunction with my editor, Jo Field, because I had so many people asking me for advice about writing it seemed logical to put it all in a single, small book, and then publish it on Kindle at a modest price. I hope to produce it in book form soon. 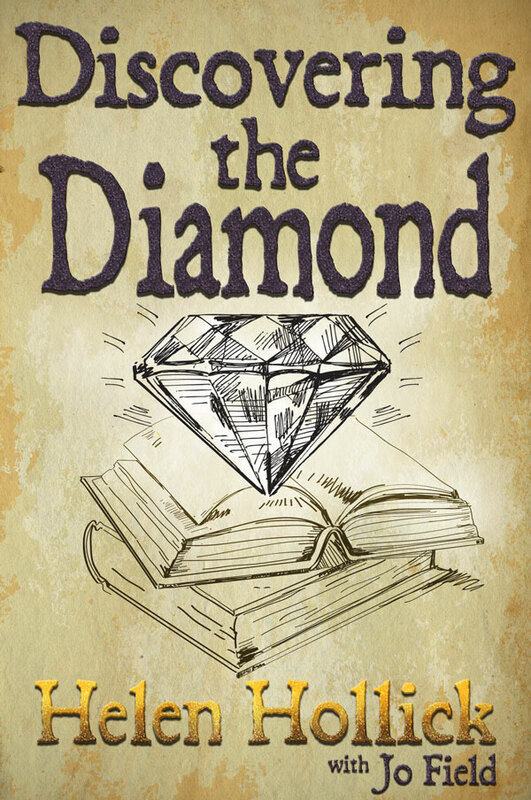 Discovering the Diamond was written by Helen and her editor, Jo Field, because so many new writers kept asking the same question: "How do I polish my book?" Discovering the Diamond is a useful collection of hints, tips and advice for new, novice and “wannabe” writers, put together in an easy to read, understandable and practical format. Order using the Amazon buttons below. Everyone can write a book. Not everyone can write a readable book. Writing is the easy bit. Most of the work is in the planning (the thinking), in the structure (the plot), and in turning the first draft into a readable, enjoyable, top quality novel. All of which involves reading, and re-reading and re-reading again! Your idea, your characters, the pace, the style, all of that may be fantastic, but without a thorough edit, without checking for technique, consistency, continuity, grammar, spelling and punctuation, your novel will not shine. Of course it is nice to have a book in print and know people have read it, but is that enough? As an established author, I want my work to be read not just once, but again and again. I want readers to think of my characters as old friends and dip into the story every now and then to refresh the friendship – and with each reading to experience the same excitement and enjoyment as they did the first time. You can achieve this, but only if your novel is well written. If great chunks of it are a little tedious, or there are too many errors of continuity or “believability” your readers will give up on you and not come back for a second bite – or indeed, will lose interest and never finish it in the first place. How you go about publishing your novel is largely a question of what you hope to achieve and how much, both in terms of time and money, you are prepared to invest in it. Are you looking simply to see your words in print - or are you hoping to gain some financial return for your investment? Unless you are incredibly talented and incredibly lucky (or both!) there is a high probability that your novel will not be accepted by a mainstream publisher. There are, of course, solid financial reasons for this. Publishers are in the business to make money; you may have written a masterpiece, but unless there is a market for it, bearing in mind they are looking to sell tens of thousands of copies, not mere hundreds, they will pass it up. Sadly, few of us write masterpieces, but that is not why so many first novels fail to make it into the high street. In the main it is because they lack polish and are very obviously written by novice writers. "That's all very well," you may say, "but everyone has to start somewhere." Certainly that's true, but these days - more's the pity - mainstream publishers do not have the time, money or inclination to nurture a novice, even one who shows a degree of talent. They want books that already shine splendidly, that are bright enough to be instant bestsellers - and rarely are they prepared to do the polishing. The old days of publishing the basic "darn good read" has withered away. Nowadays, the majority of publishers refuse to accept work that is not submitted via a literary agent. Agents receive hundreds of submissions weekly. If your book happens to be one of the lucky ones it might get looked at. Many are not. Some don't even make it out of the envelope (there can surely be no other reason why so many SAEs fail to find their way home!). But let's be positive and suppose yours is one of the lucky ones. Your opening paragraph must grab the agent by the throat, hang on like a terrier and not let go. Few agents will read beyond the first page unless something sparks their interest; even fewer beyond the first chapter. Present a manuscript full of errors and typical novice 'mistakes' and neither agent nor publisher will read any further. On the other hand, polish your work, make it a cracking good read and show you have potential; then maybe - just maybe - you will be in with a chance. At the very least, you will have done the best you can for your novel. Imagine you have been invited to a job interview or an important social event where your future rests on making a good impression. Do you turn up looking scruffy with the attitude that if these people can't be bothered to look beneath your appearance to find the real you, then it's their loss? Or do you dress to look smart, stay on your best behaviour and try to scintillate? Most of us would go for the latter - so why send your novel to an agent or publisher in a half-finished, dull, unpolished state? "This book is excellent, both for the beginner and the experienced writer. I cannot praise it highly enough. If you want advice from a writer at the top of her game, this is the book for you!" "Helen Hollick and Jo Field have produced a concise, easy-to-read and very useful guide to writing and editing fiction and and preparing it for publication. It only takes a few hours to read, and its packed with useful advice and examples. New writers who are considering self-publishing their work, either in printed form or as e-books will find it invaluable. The book is divided into just six chapters, and I found the chapters on writing technique and editing especially valuable. I am a self-published author, my work is a family memoir rather than fiction, but I found everything that Helen and Jo had to say was equally relevant to my chosen genre, and I wished I had had this advice before I published my book. I have no hesitation in recommending this book to new and established authors." "This little volume doesn't cost much and won't take long to read (I finished it on a long car journey) but that small investment is very worth while. It should be compulsory reading for every aspiring writer. Like the diamond in its title, it's compact but valuable, drawing on many years' first-hand experience before the empty page. Although Helen Hollick is now a successful and popular novelist, she's not too proud to share mistakes that she's made in the past and generously allows us to learn from them - and from her triumphs too. Although primarily aimed at novelists, this book contains many pointers relevant to non-fiction writers. All the advice is imparted in a friendly, supportive manner that make it very easy to access and absorb. Even the most defensive authors who bridle at the thought of anyone editing their work will be gently persuaded to hone their work until it shines. I love the title and its implication that underneath your rough rock of a book there is a diamond lurking, if only you are prepared to spend long enough polishing it. Discovering the Diamond will soon become dog-eared on many an apprentice writer's shelf through constant reference. It is in itself a gem, and a polished one at that."